Written Step-By-Step installation instructions and tips along with turf samples & a $15.00 off coupon! 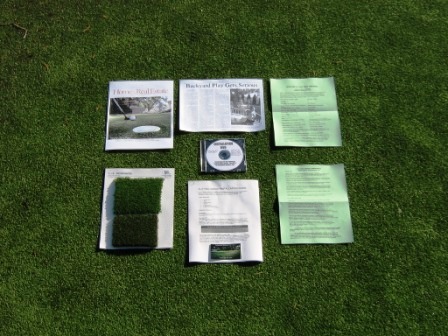 Included are samples of both our Premium Nylon & Omni Directional Polypropylene Synthetic Putting Green Surfaces. Our detailed TJB-INC written instruction manual covers the installation of both Nylon & Polypropylene putting green surfaces, Base Preparation, Cup Installation, Seaming, Cutting of synthetic turf & Cup Holes, and Proper Bunker Construction. Helpful hints from our own installation team, proper cup installation, link to on-line installation videos, and even how to build a sand bunker for your backyard putting green. We will include a coupon for $15.00 off any green purchased from www.ShopTJB.com or TJB-INC.
Free USA Shipping on this item! NOTE: We no longer suppy an Installation Video with this item. We found it to be outdated and confusing to our customers. Our written instructions are updated as necessary as we discover new tools or methods that make synthetic turf installation faster & easier for our customers. From Anonymous of Baton Rouge, Louisiana on 5/14/2012 . 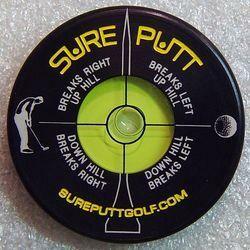 10/19/2011 – Need to know the best way to side seam the one Putt Forest Green. And also the best way to cut the material. Thank You . . .